German project developer juwi has installed their first combined wind and solar plant in Egypt to be used for desalinating and pumping irrigation water for farms and it is monitored and controlled remotely from Germany. 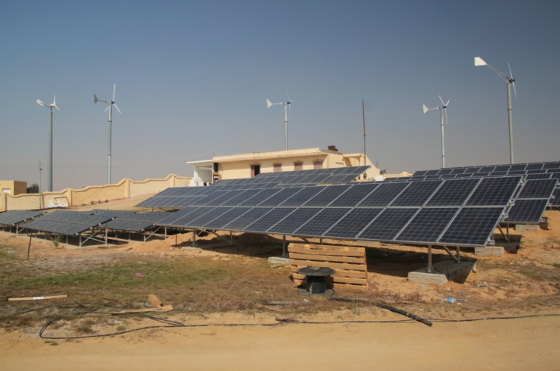 Located halfway between the bustling cities of Cairo and Alexandria in Wadi El-Natrun, the new plant is comprised of four 12 kilowatt wind turbines and a 50 kilowatt photovoltaic array, along with battery storage of around 500 kilowatt (KW) hours that allows farmers to pump water twenty fours hours a day, seven days a week. Long reliant on increasingly dirty, expensive and unreliable diesel generators, Egyptian farmers are slowly being introduced to cleaner water-pumping solutions. Karm Solar has been perfecting cost competitive solar-powered water pumps for some time and are currently working on a pilot project in an as-yet undisclosed location, but this is the first time that a hybrid solar and wind-powered pumping system has been introduced to the country. With 2,000 plants and 2,000 megawatts under their belt already, juwi has a great deal of experience with delivering clean energy to both developed and undeveloped nations, but getting the Wadi El-Natrun plant underway was a formidable challenge. All of the technical equipment, PV modules and inverters were shipped from Wörrstadt to Egypt in five freight containers, while the four wind turbines and battery storage system traveled separately from the Netherlands. Working with an electronics company in Alexandria, juwi managed to assemble the pieces in just two weeks. “We haven’t just brought water into the desert, we have also transferred our know-how to people who can directly apply the knowledge,” explains Jochen’s colleague Norbert Borchert. While know-how has been transferred, the solar plant can be monitored via the internet from Germany using GSM remote monitoring. “That way possible faults can be detected in real time and be sorted out immediately by local electricity companies,” according to a recent press release. The University of Alexandria, which is conducting studies in the area to determine how to make the existing soil fit for agriculture, has put the project out for tender. I think that solar energy will not be a problem in sunny Egypt.